Do you trust your doctor to do what is best for you and not for himself? How about your dentist? 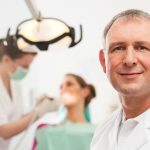 What with the recession and all the job losses, fewer people have dental health insurance (33% of Americans are putting off a dental visit for reasons of a lack of money or insurance, find some health insurance companies). And dentists are seeing fewer paying clients in their chairs. The American Dental Association finds that half of all dentists in the country say that their income has dropped over the past year. And those who specialize in cosmetic dentistry have found that they have made only 60% this year of what they made three years ago. Some dentists are even sending out coffee mugs and other little gifts to their patients just to remind them that a little dental care may be in order. But there are dentists apparently who do things that are not that subtle. Complaints to the Better Business Bureau against dentists have gone up 10% this year. The complaints are about dentists who pressure their patients into getting expensive crowns and other treatments that they don’t need. They do it for the commission. Patients who are already financially vulnerable, when they listen to their dentists’ marketing pitch, really don’t know what to do. Are they supposed to trust the dentist when he says that they absolutely need a whizbang new crown that costs five times more? It’s just that dentists struggle with some spectacular financial burdens. A dentist’s education can cost a half-million dollars. Just starting a practice usually costs $1 million. And each piece of major new equipment that comes into the dentist’s clinic usually costs tens of thousands of dollars. Almost all dentists are knee-deep in debt, and they just don’t know what to do when their stream of patients starts to thin out. There are many dental health practices where the dentists will let go of their dental hygienists and do the cleaning themselves to save a little money. You might think that that’s a good thing – having a more qualified professional cleaning your teeth. But that’s not usually how it works out. A dentist is usually far less used to doing these procedures in a way that the patient would find comfortable. Gum injuries are not uncommon. Sometimes, to begin with, some dentists raise their prices two or three times over. Patients who come in expecting to pay $300 for a crown are shocked to see that they are given a bill for $800. And then, they try haggling with their dentist, and find that their dentist is completely open to negotiating. They usually go away having knocked a couple of hundred dollars off the bill and feeling that satisfied with themselves. And then there are the rewards programs for loyal customers – er – patients. You get points for various kinds of good behavior – showing up on time, not complaining if you’re made to wait, choosing an elective procedure and so on. And you can redeem those points for vacations and the like. When medicine turns into a business, patients have no option but to keep their wits about them and choose to accept only treatment that is likely to be really important.